The lawyers won’t like this one. 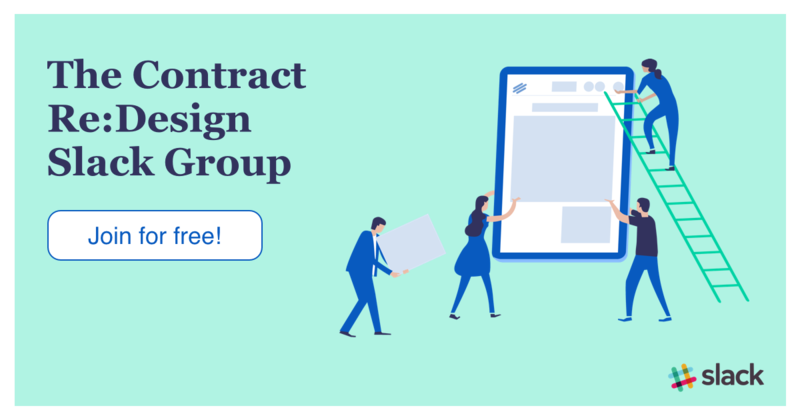 Introducing the Contract Re:Design Slack Group. We need a little bit of space. A space where we can build a community of people that think like us. That believe contracts can be less intimidating and less divisive. That they can have cartoons, audio, interactive elements, colours and other fun stuff to make them more more inclusive, more informative, and more engaging. That they can be more than just endless blocks text written by lawyers for lawyers. That they can have outsized impacts on culture, brand and growth. Let’s face it. Most lawyers will not be happy. Building contracts should involve others, not just lawyers. That artists, information designers, developers, culture folks, talent and HR peeps, entrepreneurs and other bright people can help transform contract interfaces. So we’re really excited to announce the Contract Re:Design Slack Group. A free, open chat-room where we can toss around ideas, get feedback, share projects, plan things, and connect with great people. If you enjoyed this article, please give it a few claps 👏🏼, so others can read it. Adrian Camara is a founder of Paper, the platform to re-imagine contracts and how your teams collaborates on them.